Back in October 2012 I wrote a column about a birthday present I gave myself - a Sicphones headphone amplifier acquired through a KickStarter "donation" of $279. I finally received the headphone amplifier a couple of days before I left for 2013 CES, and while it is not quite the same headphone amplifier that I signed up for, it's still a very good unit. And why isn't it the same amplifier? 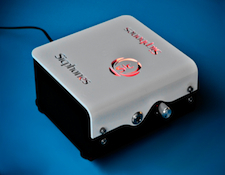 Because the maker of the principal part, SemiSouth, upon which the entire Sicphones amplifier design was created, went out of business shortly before Sicphones was scheduled to receive this critical part. Colin Shaw, the unit's principal designer had to go back to the drawing board and come up with a replacement part, which he did. 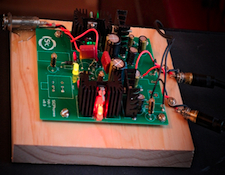 His project update #6 from 10/28/12 explained his new direction, "In preparing for the worst with respect to SemiSouth and the SJDP120R340, I spent the weekend working on an alternative (the photo is of the workbench version of the alternative built on one of the older Sicphones boards). The alternative design uses the IXYS MOSFET IXTP1R6N50D2, which I have worked with many times in the past. The IXTP1R6N50D2 makes for a very nice amplifier as well, definitely something that still achieves a great sound and a great value. It also, fortunately, works as a nearly drop in replacement for the SJDP120R340." As you might expect from such a reversal of fortune, this part replacement set the project back some, and also changed the basic nature of the headphone amplifier. Colin wrote to backers 1/1/13, "We have a dilemma and an opportunity for you to win something fun. Sicphones the name, as everyone knows, makes almost no sense anymore. "Sic" connotes Silicon Carbide, which is now out of the picture for these amplifiers with the demise of SemiSouth. "Phones" connotes headphones. We would really like, after we finish getting these amplifiers out to you, to be able to turn what we started as a project on Kickstarter into something more concrete -- a real business. However, the name that we chose for this project is outdated and limiting. So, from now until the end of January, we are accepting suggestions from our backers on what a good name would be moving forward." If you have any suggestions, send them to Colin through Kickstarter, Esprit Audio, or to his facebook page. Meanwhile, back at casa Stone, I've been spending some time listening to the Sicphones headphone amplifier, and I've been very pleased by its performance. Although it isn't as flexible as, say the Bryston BHA1, since it has only one headphone output and only one gain setting. With the "right" headphones the Sicphones headphone amplifier has proven to be very, very, good, indeed. And what are the right headphones? The most synergistic matings have been with higher-impedance Beyer Dynamic Headphones. Both the BeyerDynamic DT990 600 ohms version, and the BeyerDynamic DT880 250 ohm version performed especially well attached to the Sicphone's amp. Headphones with impedances lower than 250 ohms were less synergistic. I noticed some amount of background hiss, even with the volume level turned down to nil with lower-impedance cans. Even the Beyer-Dynamic DT-770 80 ohm version had some hiss, and all of the Audio-Technica headphones in my collection, including the new ATH-900x, had background hiss as well. My conclusion is that the Sicphones device, while not exactly a one-trick pony, is best suited for high-impedance, difficult to drive, pro-style headphones. Since I have more than one pair of high-impedance cans, this is just fine with me. But if my collection of earphones was limited to higher-efficiency low-impedance headphones, obviously, I'd be less enamored by the unit. 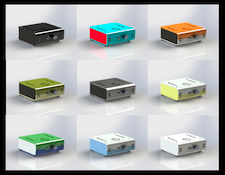 As to whether Colin Shaw will be making more headphone amplifiers based on the Sicphone design, that's anyone's guess. The whole process has not been without a high degree of stress and strain. His most recent update #16 included these final paragraphs, "The plan at this point moving forward is to continue with this amplifier in slightly modified form in the short term. This means altering the PC board slightly and probably means choosing a different power supply. This amplifier will be the entry-level amplifier...Sad news: The news is simply prefaced by saying that it really is difficult to produce something the way this has been produced. It has been a labor of love making these, hoping that we are doing it at least somewhat well, and hoping that people would like the amplifier. It has taken an incredible amount of time and effort, especially with some of the setbacks along the way, such as the closure of SemiSouth. But we are making it work, and hope that we have done good service in the process. The sad news is, unfortunately, more personal. It is with a sad heart that right near the end my wife has decided to divorce me and move on in her life. It makes it very difficult, though at the same time building these last amps is also therapeutic. I would never claim that I don't have the mind of a cynic, so I will just leave it that she must not care too much for headphone amplifiers. Thank you all for caring about what we are trying to do and for supporting us. It really means a lot to see a dream turning into reality."